When I started to follow county cricket, more years ago than I care to remember, there were seventeen First Class counties and had been since 1921. I found out years later that in 1949 there was some discussion about the elevation of Devon, but to this day have never read anything on that subject beyond a brief paragraph at the rear of the 1950 edition of Wisden, from which it would appear the suggestion was given no more than a cursory consideration. When, therefore, in 1992, Durham became the eighteenth member of the club it was an exciting development. The debut season saw the newcomers’ band of local youth and hard bitten experience bought in from elsewhere finish last in the County Championship, a disappointment tempered by more respectable showings in the three List A competitions. There were two books published to celebrate the elevation, From Minor to Major by Simon Hughes, and Durham CCC; Past Present and Future by Jack Bannister and David Graveney. Hughes and Graveney had both played in that first summer neither, it has to be said, with great success. It was several years before Durham amounted to very much, but they slowly improved until in 2007 they won the Friends Provident Trophy, and the following year the biggest prize in county cricket, the County Championship, was theirs. The success was no fluke and Durham repeated their success in 2009, and again in 2013. After less than twenty years the most northerly of the counties had become a power in the land, a position there seemed to be no reason to suppose they would relinquish. Their headquarters had staged Test matches and ODIs, a number of their men had been selected for England and there were two more books of a celebratory nature, Tim Wellock’s Summers With Durham and Tom Moffat’s The Impossible Dream …… Come True. The twice yearly fixtures between Lancashire and Durham, which always used to be a pair of maximum point victories for the Red Rose, had become something to dread. Sadly of course the firm foundations that had been laid proved not to be deep enough. The ambition to establish the Riverside as a Test match ground had destabilised the county’s finances. The success could not be maintained and the tale of financial woe led to the loss of the ground’s international status, of international players like Scott Borthwick, Mark Stoneman, Keaton Jennings and Graham Onions and, at the end of the 2016 summer Durham were, despite a successful rearguard action, relegated by order of the ECB and, to rub salt into the wound, given a 48 point penalty for 2017. Author Stuart Rayner is based in the north east, and he has already written a detailed account of the travails of Durham’s neighbours Yorkshire, The War of the White Roses, that we reviewed here back in 2015. He has been covering Durham cricket since 2005 and is ideally placed to summarise the events already related by Bannister, Graveney, Hughes, Moffatt and Wellock and then take it on to cover the rollercoaster years of the last decade. Are Durham’s woes self-inflicted or have they been harshly treated? The popular perception, and certainly the one adopted by this reviewer, has been to follow the usual British habit of supporting the underdog and believing, without it must be conceded being in full possession the facts, that the villain of the piece is the ECB. Now I understand the entire sequence of events I must confess to having rather more sympathy with the ECB than previously. But the fact remains that Durham’s rise to prominence was as a result of hard work and good management, and whilst mistakes were made the ECB certainly did not discourage the county from making those mistakes and in many ways seem to have been much more interested in punishing than supporting. The county have made errors of judgment, but the punishment handed out does not fit the crime. When I was a young cricket fan the way the game was run was conservative in the extreme, but it did lead to an era of unprecedented equality amongst the counties with there being no fewer than eleven different winners in the fourteen seasons between 1968 and 1981. Ambition has led to a more entrepreneurial spirit in recent years and Durham are not the only county who have, at different times, lived by the sword and then almost died by it. The county’s story is a salutary lesson in many ways and it has certainly not been solely responsible for its own misfortune. The long way back is however a journey the north easterners will have to do on their own. I hope they succeed. 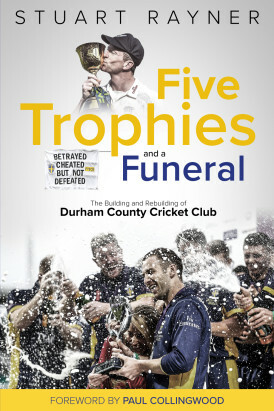 Five Trophies and a Funeral is an excellent read and tells its story very well, the introduction penned by the man who has seen it all, Paul Collingwood, being a masterpiece in itself. As to the production quality the book comes from Pitch, so that is a given.